MY Piano Study, Inc. proudly presents New-Collab Music Festival in the summer of 2019! We know that finding fun and rewarding activities for your kids in the summer can be a chore. So, we are making it easier for you! 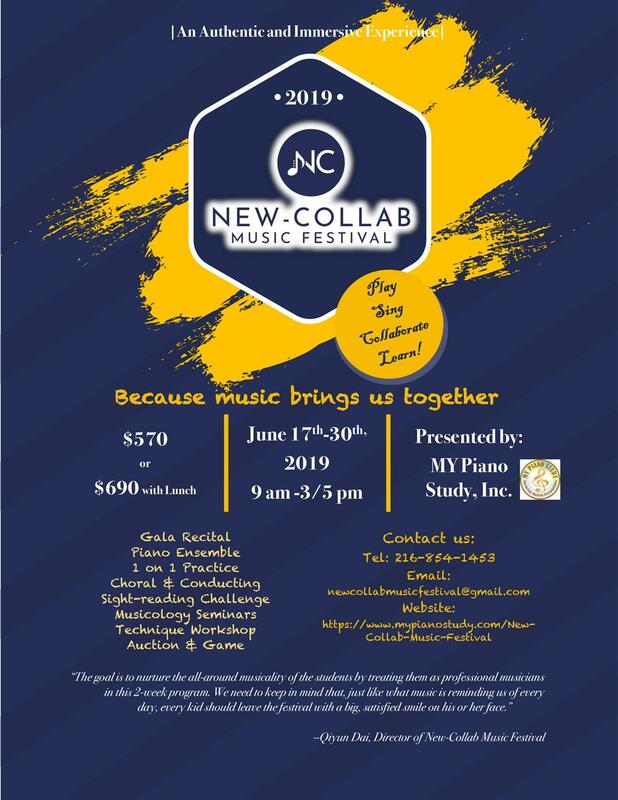 MY Piano Study, Inc. presents its standalone summer program "New-Collab Music Festival" for 2019 aiming to provide with you and your kids a "one-of-a-kind" experience of your musical life! The program is 2-week long from June 17th-30th(excluding the weekend in the middle), 9 AM - 3 PM daily. Your kids will be treated not only with love and care but also with professionalism and enthusiasm. We have put together the most capable team and are busy preparing to give your kids a blast for this coming summer! Contact us for any inquiries! We are just as excited as you are, if not more! Because of the special set-up of the festival, we have a process which we would like to call "Getting to Know You!". Upon receiving your registration, we will send an electronic package to your E-mail. It will include some excerpts of music. After a week or two, we would like to see some video clips of your kids playing & singing those excerpts. Please be advised that this is not an audition. It is only for our reference in making decisions for their ensemble groups. The details will be included in the package.